Making homemade Christmas gifts this year? 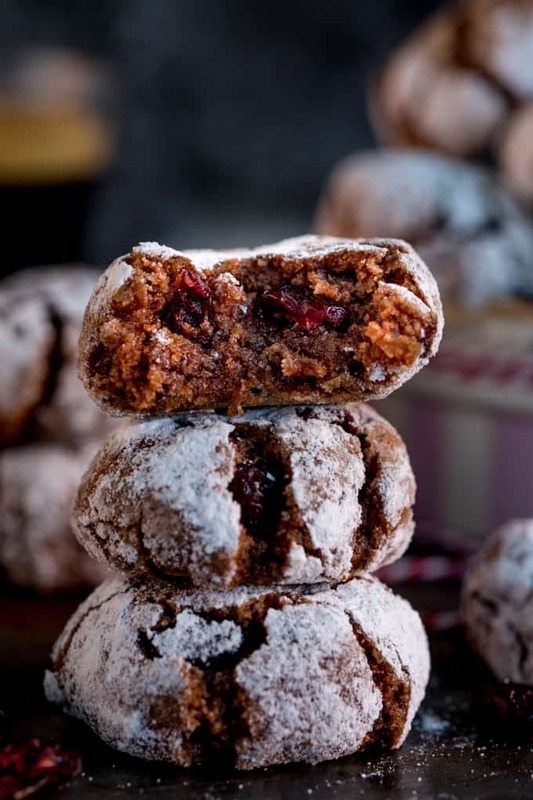 Try my Chocolate Cranberry Amaretti Cookies! 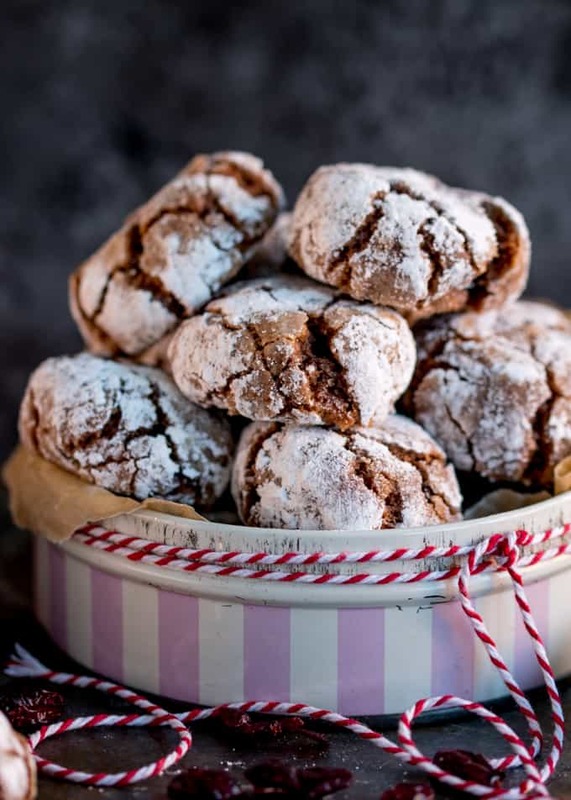 The cookie/biscuit I make most often is hands-down the amaretto-spiked amaretti. 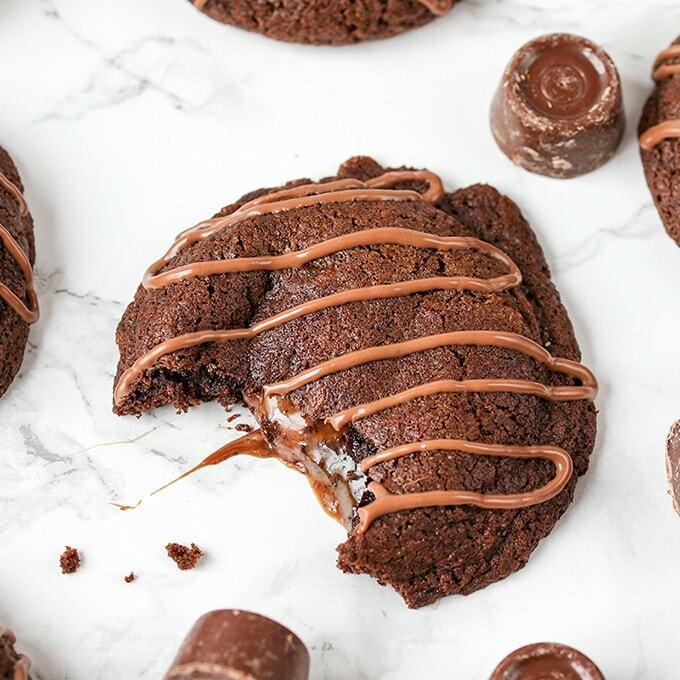 Naturally gluten-free, they’re crispy on the outside and chewy on the inside. I love making a big batch so that I have a large jar full when guests visit. They keep for weeks too – although they generally don’t last that long! 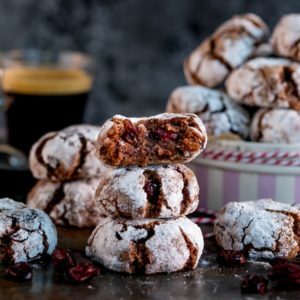 Although I still LOOOOVE the original cookies, I wanted to make a Christmassy version – so of course my brain automatically went to cranberries!! This is my second time experimenting with the original recipe. The first time was my attempt at an egg-free version – using aquafaba (the liquid from canned chickpeas) as an egg replacement. Sounds a little gross, and I wasn’t convinced when the whisked up aquafaba had a smell of cooked beans to it, but that soon disappeared when they were mixed with the other ingredients. I didn’t blog the recipe for that one, as they ended up pretty flat. They still tasted great (although a little sweeter than the original ones), but a flat cookie is not a pretty thing. A bit more experimentation need on that one I think! My chocolate cranberry version turned out perfectly though! Still gluten free, still crisp-yet-chewy. I also tried a version with Whisky instead of amaretto – and yep, that enhanced the Christmas flavour even more!! A little note if you decide to make these – please use store-bought ground almonds (or almond flour I think it’s called if you’re in the US. It’s made from skinless ground almonds and has a slightly grainy texture). 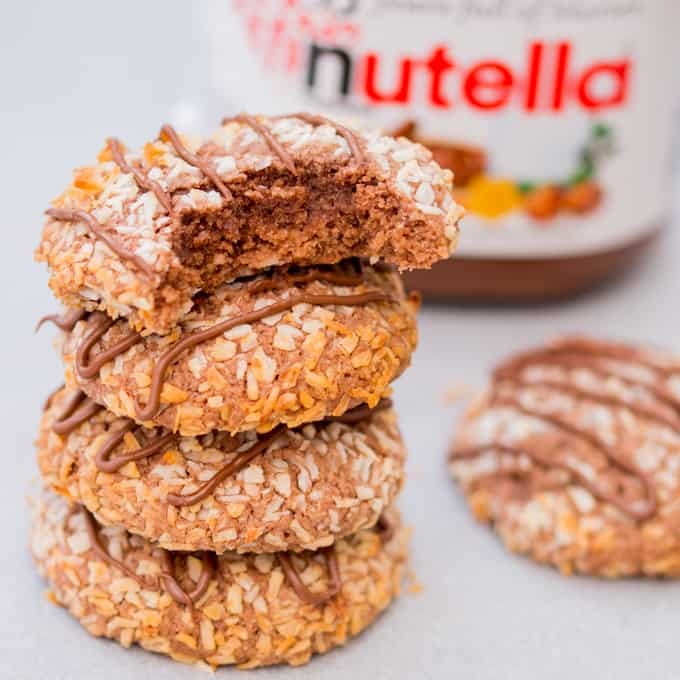 I’ve found that the texture of the cookies can vary considerably if using home-ground almonds. I believe it’s to do with the amount of oil released during the grinding process. It’s also really important to make sure the mixture is a thick, sticky paste before you pour the amaretto in there, then just pour the amaretto in a dribble at a time to make sure the mixture remains thick and sticky. 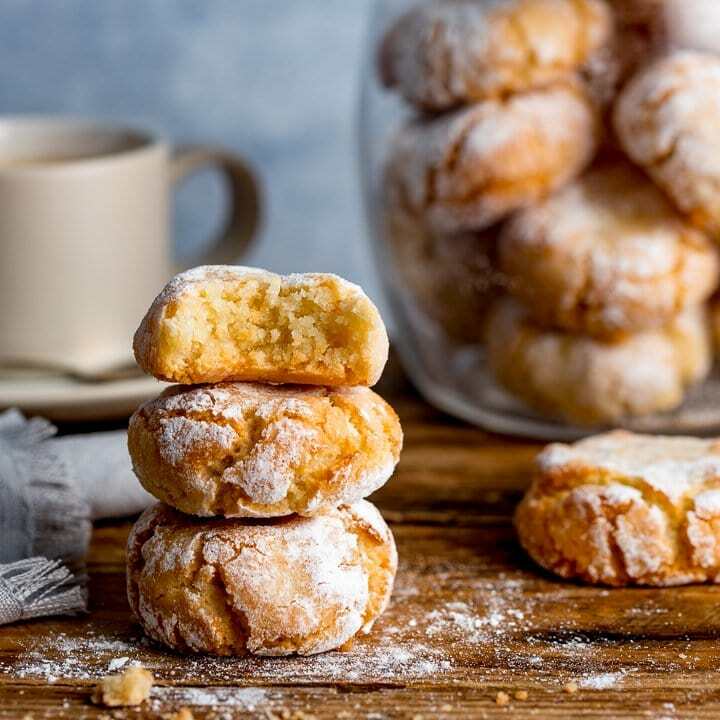 It needs to be roll-able – so that might mean adding a little less amaretto in there (you could replace with a few drops of french almond extract if you prefer). 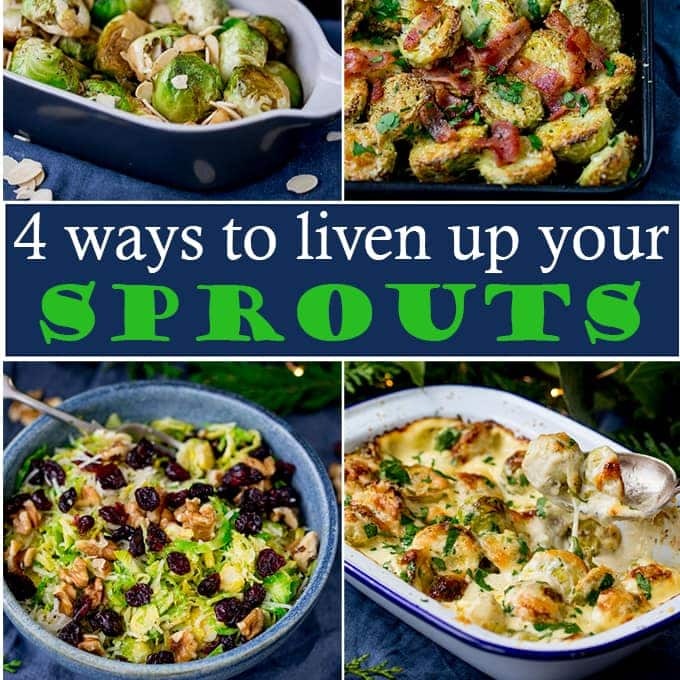 If you’re not sure, take a look at the video for my original recipe on my You Tube channel – that should give you a good idea of the consistency required. 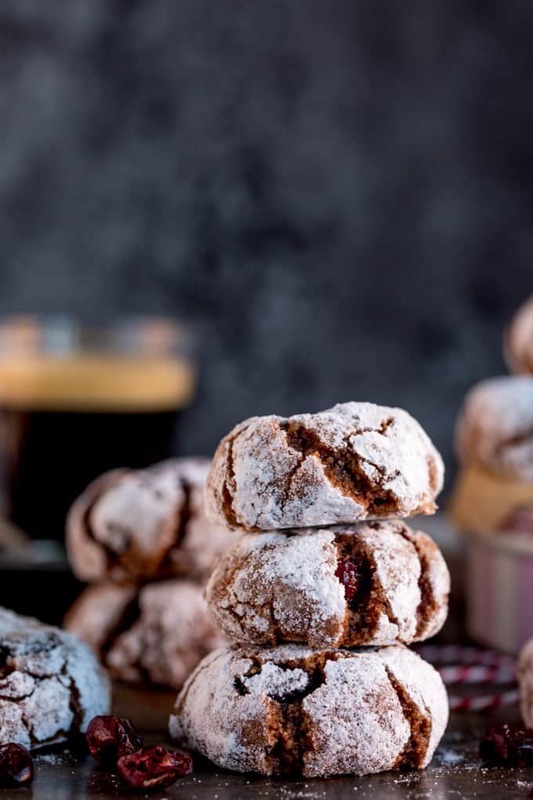 Once you know the texture you need, these Chocolate Cranberry Amaretti Cookies are so easy – you’ll be making them again and again! If you don’t like chocolate try my original version here. A Mixer. In the video we use a Kenwood Mixer but have recently bought a Kitchenaid one. Shallow white bowls. For rolling the cookie mixture in. Wooden or Silicon Coated Spatula. We have just bought these and love them. An airtight jar to store them in. I use these Kilner Jars. Making homemade Christmas gifts this year? 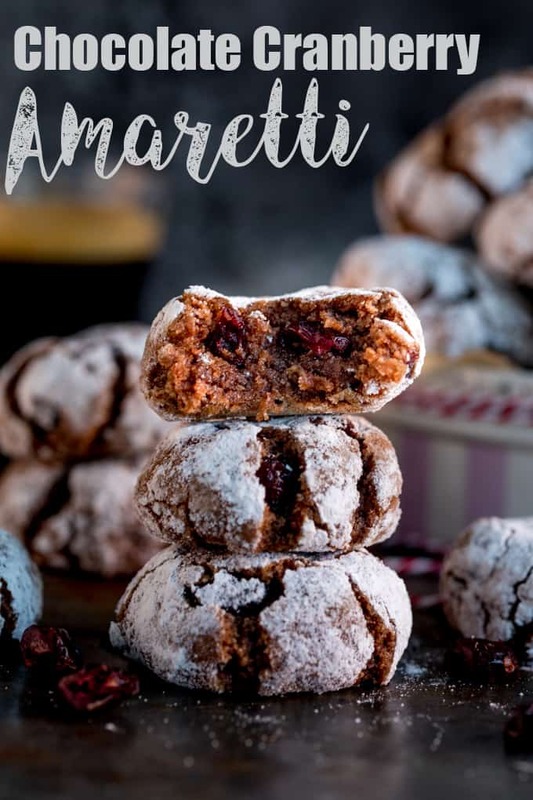 Try my Chocolate Cranberry Amaretti Cookies! Naturally Gluten Free and super easy to make! *This recipe works best with store-bought ground almonds. Home-ground almonds can give the cookies variable results. I believe this is due to the amount of oil produced during the grinding process, depending on how long you grind them for. Once cooked and cooled, stored these cookies in an air-tight container at room temperature, where they should keep nicely for up to two weeks. Some of the links in this post are affiliate links – which means if you buy the product I get a small commission (at no extra cost to you). If you do buy, then thank you! That’s what helps me to keep Kitchen Sanctuary running. I love the look and sound of these, Nic. My mum didn’t bake much (she had two jobs!) but at Christmas she unleashed her inner domestic goddess and made loads of delicious cookies. My fave were crinkled ones with loads of molasses. I know this is completely different but the look has made me nostalgic. The pairing of the chocolate and cranberry sounds gorgeous. I’m sorry that the aquafaba didn’t work out for you but do try it in other things. Lovely recipe.